Scrooge! follows a bitter old miser’s journey toward discovering the true meaning of Christmas, with the help of strange ghosts and well-spirited people. Community member Susan Candey is directing Scrooge! this holiday season. 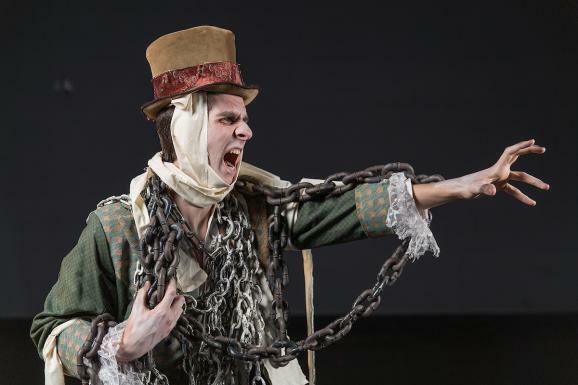 Northern Michigan University’s Forest Roberts Theatre will introduce a few surprising twists to its longstanding holiday production of Scrooge!, a musical retelling of Charles Dickens' A Christmas Carol. Performances will be held at 7:30 p.m. Wednesday, Dec. 12–Saturday, Dec. 15, with additional shows at 4 p.m. Saturday and 1 p.m. Sunday, Dec. 16. The ensemble of more than 30 performers is composed of NMU students, community members and area youth. Community member Monica Nordeen leads the cast as Ebenezer Scrooge, a role typically portrayed by male actors. The one-act show is approximately 55 minutes long. Tickets are $15 for the public, $10 for students and $5 for NMU students. They are available online at tickets.nmu.edu or at any NMU EZ Ticket outlet. For more information on the event, contact the Forest Roberts Theatre Box Office at (906) 227-2082.